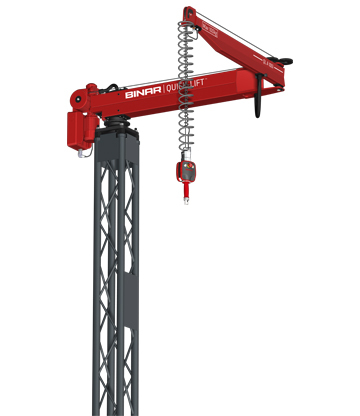 Patented Quick-Lift Systems™ transforms heavy lifting into part of an efficient and precise production chain. The lift becomes a direct extension of the hand’s movements and requires only 20 g of actuating force to lift up to 300 kg. Our ergonomic lifting devices are light weight and very easy to maneuver. Together with a stable suspension, it offers a smooth side movement with minimal risk for unforeseen oscillation. Unique integrated mechanical, electrical, pneumatic swivel enables continuous rotation of gripper. 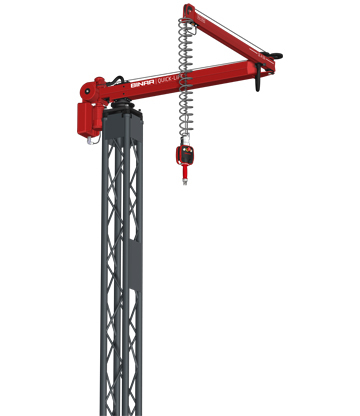 Quick-Lift Systems™ is available in the weight classes 50, 100, 200 and 300 kg. Topics: The required force to operate the Quick-Lift is 20 grams of force or equal that to lifting a pair of car keys. It is so safe, effortless and easy to use that a 2 year old can operate it with ease. Topics: Watch this educational video that shows how the Quick Lift Arm Balancer moving objects off and on a conveyor paint line effortlessly. Remove employee fatigue with a Lift Assist Device without jerky or wasted motions. 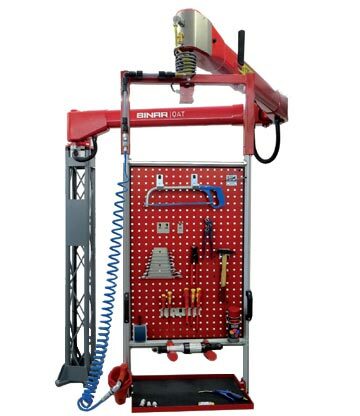 Topics: Watch this educational video that shows how the Quick Lift Arm Balancer moving car doors effortlessly. Remove employee fatigue with a Lift Assist Device without jerky or wasted motions. Topics: Watch this educational video that shows how the Quick Lift Arm Balancer moving a torque converter into place with very little effort. Remove employee fatigue with a Lift Assist Device without jerky or wasted motions. 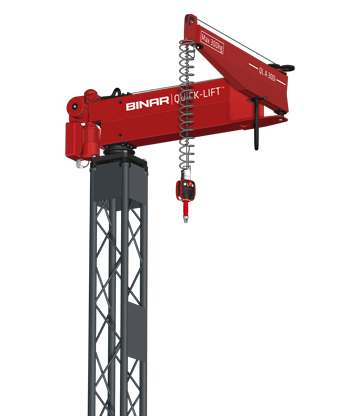 Manoeuvring is done with Binar Quick-Lifts patented maneuvering handle. Grippers are designed to fit customers need. Intelligent I/O signals are available for optimum functionality. 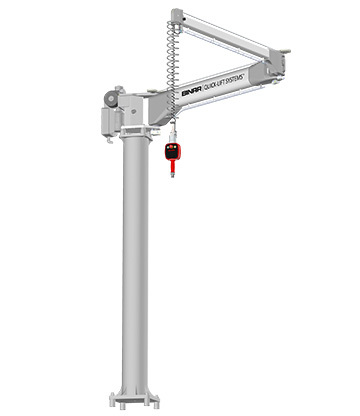 Manoeuvring is done with Binar Quick-Lifts patented manoeuvring handle. Maneuvering is done with Binar Quick-Lifts patented maneuvering handle. Maneuvering is done with Binar Quick-Lifts patented manoeuvring handle. Maneuvering is done with Quick-Lifts patented maneuvering handle. Made in painted aluminum profiles, and vertical profiles in anodized aluminum. Floor pillar in painted steel with standard height of 3 m. Optional pillar height up to 5 m depending on customers need. Tripled hinged arm of anodized aluminum profiles. Length 4,2 m.
Floor pillar in stainless steel with a height of 3 m.
Drive unit withstanding daily wash down and envi- ronments with temperatures up to 50° Celcius and a relative humidity of 80%. Handle and load cell box to be covered and protected against direct flushing. Articulated arm with tool panel. The perfect, all-purpose workstation that is always there, where it is needed. The constructive implementation of the QAT is designed to cover large work area of up to 85m2. Thus, the operator has the option of tools next to him, small and attachments, including compressed air, electricity, data management and lighting in a radius of almost 360° to carry with you. The costly downtimes are reduced to a minimum and effective work is ensured. The tool panel is configured to customer specifications. It optimizes the workplace by keeping tools, carrying loads, energy provides, transported material and if necessary, holding the coffee cup. With minimal effort, it follows at every turn. Your choice of power with the option of 2 different power sources as well as different phases. 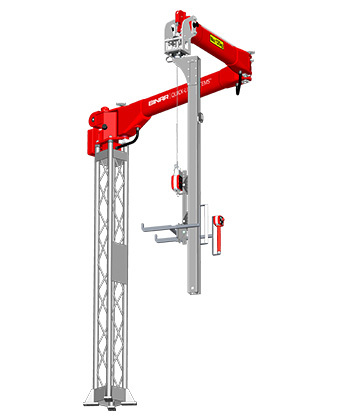 Made in painted aluminum profiles with a total length of 5.3 m.
The position of the fixated lifting motor is carefully designed and tested to give optimum maneuverability of the hinged arm. Floor pillar in painted steel with a standard height of 5 m depending on customer’s need.